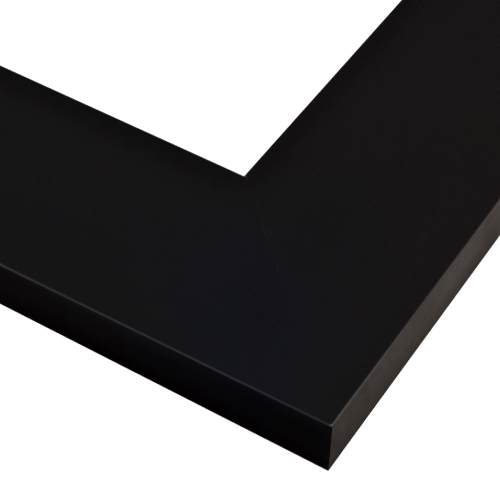 This satiny black picture frame features a 3”-wide profile ideal for canvas artwork. It’s a simple, flat-faced picture frame that will beautifully show off watercolors, pastels, oil paintings and photography. Made from upcycled wood fiber by pictureframes.com Artisans, it’s an eco-friendly, exceptional value that could as easily hang in a gallery as your living room. I ordered three of these frames in different sizes.They arrived in perfect condition. I like the sleek and modern design which goes great with my artwork. They are particle board, but still good quality. I'm happy with my purchase and will buy more. I love the sleek modern look and it enhances the beauty of the painting. I would definitely recommend it. It’s really solid and well built too. Picture frames heavily protected during shipment. Frames flawless and sized to desired specs. Great price given materials quality, desired style and color. Easy installation. Highly recommended. Great service, easy to hang! My package was missing the "glass" and foam core board. I called and they put the order on a rush and got it to me in no time at their expense. Also, the system the frame has for putting the picture wire on is the easiest I have ever seen. I was hanging the picture in no time! Item arrived in two L shapes because of poor packaging. I have to do a repairing job myself using four L shape metal parts purchased from Home Depot. Hello Kaosung. Thank you for your review. We regret to hear that your frame arrived this way. This is certainly not the experience we wish to leave with you. We are happy to replace any damaged items so that you can frame your artwork as intended. Our customer care team can assist you in receiving a replacement frame. They are available Monday-Friday 8am-7pm eastern time and can be reached at 1-800-332-8884. We appreciate your business and look forward to hearing from you! frame is particle board. it arrived slightly damaged and I had to glue it together. Overall pricing is much better than local frame shop, but I will try another online dealer next time. I bought this same frame in the past and I liked it so much to purchase it again. I liked the sleekness of the frame and it is durable and looks sharp on my wall. I needed a wide plain black frame, this fit the bill for my large vintage map. The wide width was the selling point for me. 3" will look great! This 3" black frame is perfect for my small, monochromatic imaginary landscapes. I like the width of the face. I like the clean lined look, it will look good with my busy painting :). I chose this modern style frame for a plain air painting. One of my favorites with my paintings. I need a wide flat frame to decorate to go along with the theme of my painting. Will this fit 45" H x 30" W x 1.5" D canvas print? BEST ANSWER: The Rabbet depth on this frame is only 1/2", therefore, it will not be able to fit your 1.5" canvas. Thank you! I have a canvas that is 30 x 40 can I use this to frame it? BEST ANSWER: Hello Griffin! Thank you for your inquiry. This beautiful frame is able to be cut to a custom size of 30"x40". Please take account of the depth of the canvas and compare that to the depth/rabbet of the frame. The depth/rabbet of this frame is 1/2". Thank you for reaching out to us! Hello. I have a metal picture that weighs about 20 lbs and is 23.5" High and 60" wide. I don't need any glass or matting. I would attach the picture to the frame by using screws or nails. Would this frame be able to handle the weight and size of the picture when attached to the wall? Thanks! BEST ANSWER: Hello! Thank you for reaching out to us. We can certainly provide you with the size 23.5"x60", however, the weight is very questionable. We can not guarantee the weight capacity the frame can support. We are thankful that you considered using our frames for your artwork, but most importantly we want the artwork to hang safely. We hope this information was helpful. Have a great day!